Description: Still looking fresh, NS 7595 heads a BNSF SD40-2 and a rare ex ATSF GP40X. Description: NS 361 heads south down main 2 through Waring. 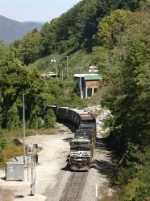 Description: The pushers of an mty TVA Kingston coal train rest just clear of the control point at "Strange" as the train awaits a fresh crew to run it back to Knoxville. Description: NS 7595 leads an Eastbound intermodal through the cut at Cassandra. Description: 21E heads west at 8:05AM as 10N waits. 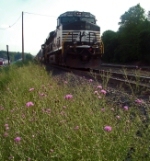 Description: Norfolk Southern train 20Q rolls east in the last hour of daylight through Cove. Description: Main Street, 1727 hours. Description: An afternoon storm has moved in, emptying the viewing area at the curve as a westbound freight moves into the curve with NS ES40DCs 7693 & 7595. Description: NS 23G passing the restored Bristol train station. Description: NS 23G nears the east end of the siding at Piney Flats after meeting the 15T at the west end.. Description: NS 16T tied down on the east end of the siding at Bristol. Description: Train 224 takes the siding while 285 holds the main. Description: NS 13G northbound train have got four engines (3 GE and 1 EMD). They are wait for road freight crews. Description: NS 40R, a grain train, awaiting a signal at CP Rose with ES40DC 7595 and D9-40CWs 9789 & 9302. 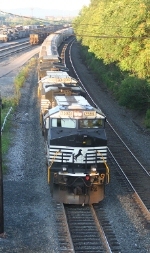 Description: NS 40R with ES40DC 7595 and D9-40CWs 9789 and 9302. Description: The DPU on 22A splits the signals at Ford.